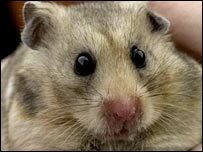 A man who flew into a rage has been found guilty of throwing a hamster in a cage out of a top floor window. Andrew Thompson, 20, of Oakfield Drive, Dumfries had denied the offence in the town in October last year. However, a jury unanimously found him guilty of recklessly throwing the hamster - which later died - as well as other items from the flat window. Sentence was deferred for background reports until 29 January and Thompson was remanded in custody. He was also found guilty of smashing items of furniture and brandishing a knife. However, the jury returned a verdict of not proven on a charge of assaulting a police officer by throwing a bottle at him and attempting to hit him. In addition, he was found guilty of an amended charge of repeatedly attempting to strike acting sergeant Allan Ross with a knife.